'Syrian women, revolt against every authority!". Poster courtesy of The Syrian People Know Their Way collective. "They brought us by bus. We were a large group of female and male comrades. I recall that we were shackled, and an increasing sense of fear overwhelmed me about reaching that place, the expected interrogation, from facing Mudar whom I thought was there, and seeing all the comrades. Mixed feelings of fear and anticipation and desire and ... But it all began to disappear en route and as I am approaching the city that I loved and still do, I did not feel the length of the road or the time that had passed by .. Damascus was looming in front of us." - Amira Huweija, member of the Communist Labour Party, from her time in Douma prison between 1987-1991. This account will try to give an overview of the role of grassroots women in the Syrian uprising in an attempt to highlight angles not widely covered by the mainstream media, in Arabic or internationally. Nor is this well represented in the narratives of the Syrian political opposition abroad. In fact in all these narratives, women are rather systematically excluded from any account of political decision-making regarding this country in such a historic phase. Women and youth have very little representation in the ranks of either the local councils or the Syrian National Coalition. So how is it that women in Syria have played an essential role throughout the phases of the uprising, a role that has shifted over time in response to the increased violence and rapid developments on the ground? Studying the women's situation in Syria, whether now or before the outbreak of revolution, without taking into consideration the government's political structure, based on its intelligence personnel and tens of hidden security apparatuses, is a dead end if we wish to understand how women's rights are directly affected by the government’s internal policies. As a woman who lived most of her adult life in Syria, I would not dare to launch a women's magazine, for example, in my university, without it being under the supervision of a government institution. The Baath ruling party had a National Students Union (NSU) set up in each university, which not only hijacked any daring independent initiatives coming from students, but also served as an intelligence body that watched and monitored closely any student who tried to lobby or organize any activity on such causes as the war in Iraq or the conflict over Palestine - even though the government boasted that it was the lone defender of Palestinian rights and was constantly attacking the US invasion of Iraq. Yet the regime understood perfectly well, that any improvised initiative, even in support of Palestine or Iraq, might pave the way for a lobbying closer to home and the organizing of active groups. I am reminding the reader that we are talking about a government that owned and occupied the public space of a country, and everything that this entailed, for more than forty years. Citizens were cultured into not initiating, not thinking or even daring to dream about challenging a system that was tightly structured on political, social, military and economic levels. Not forgetting too, that the government had widely disseminated a culture of fear among its citizens with massacres like the Hama massacre of 1982 and several arrest campaigns in later years of intellectuals, leftists and Islamists, of Syrians and Palestinians, which resulted in 20 years in jail for a dissident, with no access to lawyers or visits from family members. So one should be clear, that the major obstacle towards securing and enhancing women's rights in Syria, was simply the absence of democracy. Failing to support the people's attempts at revolution, on the official level or in the decisions of international human rights groups, is in fact a clear statement of support for human rights' abuses as a whole and not just those of women. The regime boasts about being the champion of women's rights in Syria whereas several examples rather suggest its hypocrisy. To name a few, Bashar’s rule was strengthened through an alliance with the conservative upper-class, Qubaysiyyat women in Damascus, which according to the Al-Hayat newspaper report, resulted in building 80 schools in Damascus alone, hosting more than 75,000 girls. But the regime failed to reform the personal status laws and insisted on appointing female ministers to insignificant positions. A perfect example, one might add, of how intersectionality can be deployed as the path to address a groups' human rights abuses, is afforded by looking at the government institution, the General Women's Union. The government body, for instance, did not raise “honor-killings" as an urgent national scandal to be addressed, instead calling for punishment of the murderer for a minimum of six months, as stated in article 548 of the penal code - terminology adapted from the French code of 1810. Many young girls were killed in the name of “honor” based in this article. Ironically, it was only after the Tunisian and Egyptian revolutions broke out in 2011, that Bashar Al-Assad himself issued the first legislative decree of 2011 to replace this with a maximum punishment for the killer of five years in prison. Such a decree was seen by many Syrians around me at the time as a pathetic attempt to appear as the protector and saviour of 'the women's interest', especially on such a fashionable subject for the west as women. Because change in Syria could only happen through the ruling government, specifically through the president himself and the close circles around him, there was absolutely no opportunity for the people to practise their right to self-determination. It is always important to remind the reader that the first person ever to dare publicly to ask president Bashar Al-Assad to step down was in fact a woman, and from the minority community: the Druze. Muntaha Al-Atrash, daughter of Sultan Atrash, the leader of the so-called “Great Syrian Revolution” of 1925. On April 12, 2011 when out of fear, the protests in Syria were mainly asking for reforms and not for the toppling for the regime, Atrash, in a phone interview with Al-Shark Al-Awsat newspaper, called Assad to step down in response to peaceful protests. In 2011, Razan Zaitounah was among many others, one of the main sources updating people on the protests in Damascus and its suburbs. Women started to take to the streets along with their male comrades and were detained in the process: Doha Hassan who is a Palestinian, Nura Al- Ghamian, Hanadi Zahlout, Rima Flehan, Mai Skaf, Lina Mohammad and many others in Syria I cannot name for their protection. It is important to stress here, that even though men are more targeted than women by the regime in their mass raids and detention, being in detention and prison for women is often harder than it is for men. Although women mostly avoid as tough a treatment as male comrades in jail, jailing women often imposes a social stigma on them, not to mention the issue of sexual abuse. Nevertheless in time, women started organizing themselves in women's groups, like the Syrian Women for the Syrian Intifada – SANAD , two members of which I was privileged to meet. The group's main activities are to support the martyrs' families as well as the detainees'. SANAD's activities broadened later on to support grassroots' activists for those who lost their jobs because either they were fired for their political stances, or forced to go into hiding when they learnt that they were wanted by the regime. The regime often arrests people from their workplaces. The group would raise funds from close circles and support activists to continue their work in aid, media or securing medicine. Not many groups were as well-formed and structured as the one mentioned above. In fact, SANAD was particularly successful in forming a vision, goals and specific activities, because its members were older and more experienced in organizing. Unlike other groups of enthusiastic younger generation activists, who in time vanished due to their inability to sustain the many activities they tried to maintain under the watchful eye of state intelligence. Nevertheless, the emergence of groups like SANAD would not have been possible without the revolution and the space it provided for citizens who were denied the right to organize - but who did so in secret over the past forty years. To give another example, most of the neighbourhoods that revolted against the regime were of the rural and working classes. They usually are conservative and women in these areas usually work with strange men only if they are doctors, nurses or old women. Covered and uncovered female activists who come from different conventional communities, also from the upper classes, worked hand in hand with the male leaders of these working class communities: in organizing protests, in securing banners, printing banners and flags (since they were all handmade) and securing medicine and equipment such as smart phones or internet 3G. Such social interaction, outside the common clerk-client relationships in government institutions, was a real innovation and resulted in undermining and clearing up some stereotypical images in those communities. Similar interaction occurred heavily between Palestinians and Syrians during the uprising. Yarmouk camp in 2012 was the main host for many internally displaced families and was a vital collection point for securing medicine for other neighbouring cities. I remember vividly the Palestinian mother who was given her early training on first aid in case the camp faced shelling. It was actually the revolution that provided the space for citizens from different nationalities, ethnic, conventional communities, and socioeconomic backgrounds to unite, interact and organize a grassroots movement in the face of one common enemy: the regime. However, such new spaces that came into existence in the first couple of years in the uprising, gradually started to reduce with the increase of regime brutality on its people which resulted in the increased militarization of the revolution. Women revolutionaries, who basically were working on the peaceful and non-violent front, started to face a new reality, war. They had to come up with new techniques fast in order to react to this and to preserve the freedom of voice that had emerged in and because of the uprising. 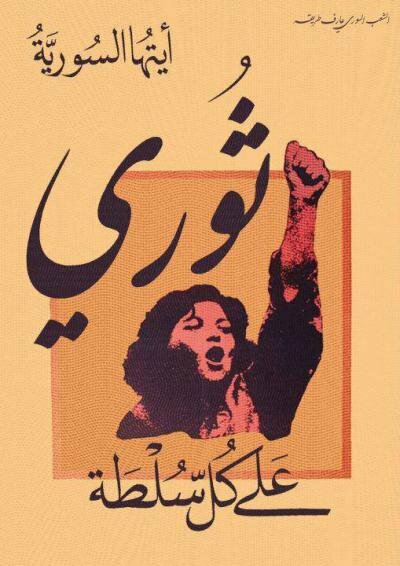 2012 in my view was the peak for women's essential role in the revolution. This was due to the regime's systematic raids and arrests targeting especially male peaceful revolutionaries. As a result, women revolutionaries had to organize themselves in cells to fill in the gap and used to good effect the sexist view of them as a “weaker gender” to pass regime checkpoints in order to smuggle medicine, food, and also first-aid workers into besieged and shelled neighbourhoods. In fact, revolutionary women from minority traditional communities also used the sectarian classification of them by regime checkpoints in order to smuggle in aid into besieged neighborhoods. In time, some regime checkpoints discovered some of these networks and started checking IDs and to this very day, search cars driven by any woman who was not covered and also from a minority community. This peak of the women's active and essential role in sustaining relief, among other activities, in besieged neighbourhoods in Damascus and its suburbs in 2012, started to minimize in 2013 with the regime’s increased brutality, the sheer amount of massacres and the lack of human capital among the revolutionaries capable of responding to the humanitarian crisis. Accordingly, the belief among young men, even among some peaceful revolutionaries, was that the only way to topple the regime was with an increase in arms. This conclusion played a big role in strengthening the militarized front of the uprising. And this development directly affected the women's role in the uprising. Revolutionary women who used to visit other cities to train amateur media workers and to cover untold human stories under shelling, are now facing more obstacles apart from the regime's shelling and checkpoints, in areas - mostly shelled and besieged ones - that are rapidly changing into male-hegemonic spaces. Yet, women, both traditional activists and local women residing in “liberated” areas, are undermining such male spaces by their very existence: women like Marcel Shehwaro , a woman blogger in Aleppo, Razan Zeitounah and Samira Khalil in Douma, and other traditional women activists I cannot name here for the sake of their own security. The very existence of these women and the work they are doing in these areas poses a direct challenge to the growing male hegemony that was developed during the war. Such female interference with war dynamics is equally evident amongst local women in liberated areas, such as Om Khaled in Kafranbel and many of her like in the Eastern Ghouta suburbs of Damascus. Om Khaled founded the first women's centre not only in Kafranbel, but the first in Idlib. The centre is called Mazaya and was launched due to the urgent need for women in Kafranbel to meet and discuss their situation in war. The centre gives free workshops in first aid, hairdressing, knitting and also free courses in English. The centre also owns a huge library that lends women books. Again, Om Khaled is a shining example of how local women are reclaiming their voices due to the spaces produced by the popular uprising. Despite the growing militarizing front of the uprising and the growing male-hegemony, women are still able to reclaim their voice and the role that was long-ago stolen by the regime. In the mainstream coverage of Syrian women today, one cannot help but get the impression that women must either have been “raped,” “sexually abused,” or “displaced.” The necessity to document all sort of violations committed against citizens, is unquestionable. The lack of similar effort, however, in portraying women in Syria on the ground as active participants in the revolution as writers, human rights lawyers, doctors, teachers and politicians, when they are heavily engaged in such activities, is indeed perverse, especially when this constructed image of Syrian women hasn't changed one iota over the past three years. Razan Zaitounah is a name that has become famous in the past three years. Zaitounah is currently still forcefully disappeared and kidnapped by an unknown armed group in Douma suburbs of Damascus along with her husband, Wael Hammada and two of her colleagues at the Violation Documentation Center (VDC), Samira Khalil and Nazem Hammadi . Zaitounah is the co-founder of the Local Coordination Committee (LCC), a revolutionary secular news agency that emerged in 2011 to update the world on mass protests across Syria. The group's importance comes first and foremost from being a network of women, and then for being the first revolutionary semi-organization to launch as a somewhat professional, credible and sustainable news agency regularly quoted and cited by international and regional media outlets. Zaitounah is also the co-founder of VDC which is the only platform inside Syria that documents a list of Syrian martyrs, detainees, kidnapped civilians as well as documenting violations coming from all the armed groups alongside the army of the regime. As a lawyer, Zaitounah has been defending political prisoners under the Assads, father and son, for more than ten years. I once met her when she was on her way to visit a political prisoner's family in 2010. Not many lawyers dared to follow Zaitounah's path in fear of regime consequences. She used to visit detainees' families, and defend them in court - which many Syrians at the time did not dare to attend. Zeitouna would issue statements to the public informing them about the detainee's situation and the lack of transparency of the Syrian juridical systems. Zaitounah was banned from traveling in 2002 and received several threats by the security apparatus for her work on human rights long before the uprising started. Ever since the revolution in Syria broke out, Razan worked underground for two years in Damascus, changing homes and places, to then settle in a “liberated area” in Douma, only to be kidnapped with her colleagues by an armed group there, due also to her work in human rights. Despite living under constant shelling, a survivor of chemical attacks and despite these extraordinary circumstances, Zeitounah faced life underground for two whole years. Her efforts in co-founding and developing LCC as a credible news agency, and VDC as a transparent documentation centre of human rights violations as well as other groups inside Douma today to support local women and to secure jobs for citizens there, are determined attempts to institutionalize revolutionary work in Syria, and to secure sustainable and professional results. Zeitounah, who is an experienced human rights lawyer due to her work prior to the revolution, understands very well that in order for a country to reach peace-building and transitional justice, human rights advocates should document transparently what is happening. On this basis there is a chance of rebuilding the state in the future. Even though Zeitounah is kidnapped today, the work of both organizations, LCC and VDC, continues still. This is the legacy of her efforts in creating a decentralized institution rather than being centralized under her sole supervision. Such efforts are rare among revolutionary groups today. This must serve as one overview of the women's role in the revolution that takes into consideration the historical and political obstacles faced by women and their male comrades alike. We cannot possibly hope to cover fairly the amount of work women in Syria have done in the past three years. I am one of many women in Syria who have different point of views and takes on this topic. But I sincerely hope that my fellow women comrades are also given the chance to express and document their views on this too.